Kim moves into her own apartment, in a building by the marina managed by her mother's brother Herb Hinkley. When an amorous race car driver puts the moves on her, Kim uses karate to put him in his place. Special Notes: This episode was used as a pilot for a TV series for a Lucie Arnaz sitcom spin off from the show. Vivian Vance is set to replace Lucie on Here's Lucy, but becomes ill with cancer and most likely Lucy doesn't pinch CBS due to Vivian Vance's sudden illness. With the pilot's failure, Lucie Arnaz is needed back and returns to the fold for a fifth season playing Kim Carter. 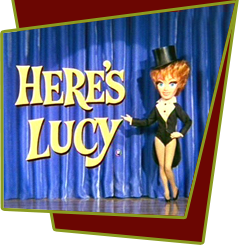 The cover photo used for the third season of Here's Lucy is situated in a picture frame on a table directly behind Kim's couch. Bloopers: When Kim goes to unlock the front door of her apartment, the sliding latch breaks off and goes flying. Lucie, a thorough professional, just ad-libs, "Oh fine" and proceeds with business as usual.